Isn’t it amazing that people can look at the same thing and see two different things? Moses acquiesced to the requests of his People and sent twelve spies from the Paran Desert to explore the Promised Land. The selected reconnaissance men were ranking members of their respective tribes. Each was a distinguished, righteous man. The 40-day mission concluded with a report to the nation. Two of the spies, Joshua and Caleb, eventually settled in the Land of Israel with the Israelites. The other ten died in disgrace in the Paran Desert. What had happened? All twelve spies saw a land that flowed with milk and honey. They all saw ample fruits and Canaanites. The problems began when their respective minds drew very different conclusions from the information their eyes had provided. Joshua and Caleb saw a beautiful and holy land that G-d was prepared to give to them. Their fellow scouts saw an aggressive Canaanite fighting force that would repel any Israelite efforts to inhabit the land. Caleb and Joshua were in the minority. The Israelites believed the negative reports of the majority and wanted to return to Egypt. They feared for the welfare of their wives and children. As a result, G-d decreed that they would get what they had asked for. They would NOT enter the land. Rather, the nation would wander in the desert for 40 years (one year for each day of the mission) until all of the adults who had rejected the Land of Israel had died. Only then would THEIR CHILDREN enter the land. Amazing. These people personally witnessed G-d’s ability to wreak havoc on the infrastructure of the powerful kingdom of Egypt. Yet, they were afraid of a couple Canaanite nations?!! They saw the Ten Plagues and the drowning of the Egyptian cavalry. They knew what G-d was able to do for them. Didn’t they realize that with G-d’s help THEY COULD EAT THE CANAANITES FOR LUNCH??!!! In all due respect, both of these concepts seem to be a stretch. Will color association and number games really keep us on the straight and narrow path, if we would be otherwise tempted to stray? Rabbi Moshe Feinstein, of Blessed Memory, asked an additional question: The Torah requires us to attach these fringes only if we are wearing a garment that has four corners. (For example, a Tallis or a poncho.) However, we are not technically required to put on such a garment if we don’t want to. Strictly speaking, if we would choose not to put on the large Tallis that we wear in the synagogue, or the small Tallis that is worn under the shirt, we would be exempt from wearing Tzitzis. If the Mitzvah of Tzitzis is so important, why is it optional? 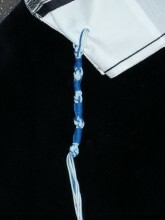 Rabbi Feinstein answered that Tzitzis are NOT an instant source of inspiration to those WHO CHOOSE NOT TO BE INSPIRED. If we are inclined to be receptive to the message of the Tzitzis, we will look at the color and think of G-d’s throne. If we possess the spiritual sensitivity to WANT to be inspired, we will do the math and come up with 613. If, however, we are not looking for this message, we’ll see nothing but knotted blue and white strings. Insisting that an uninterested person wear Tzitzis sends a message to a place where nobody’s home! We can now understand the situation of Joshua and Caleb vs. the “Paran Ten.” The ten other spies weren’t interested in “making Aliyah.” Therefore, it was very easy to come up with reasons why the Land of Israel was unassailable. Where Joshua saw opportunity and G-d’s all-powerful hand, the others saw roadblocks. Joshua and Caleb looked for G-d’s power and might, and found them. The others looked for excuses and found them. If we are open-minded and receptive to what G-d wants to tell us, we can see His influence everywhere. A little blue string or a blade of grass is all it takes. If we are not interested in what G-d wants to tell us, ten THOUSAND plagues won’t impress us. When I was little boy, my parents used to take me to concerts to hear classical music. It was a total waste of time and money. (Sorry, Mom.) Had a connoisseur of classical music been in the audience, he might well have observed that it was a masterful performance. I wouldn’t know. I really wasn’t interested, and was therefore impervious to the delightful pleasures of experiencing a maestro’s talents. Question for the Oylm. By this Parsha, Sinai has occurred and almost all of the Mitzvos had been revealed. Many of those Mitzvas are related to Eretz Yisrael. Were the Meraglim m’chooyiv in those Mitzvos during their time in Eretz Yisrael? For those readers who are less fluent in Hebrew expressions, I will take the liberty of “translating” your question. Some Commandments, such as separating tithes from produce, only apply in the Land of Israel. Your question, if I understand it correctly, is whether the 12 scouts who were sent by Moses to spy out the Land had to fulfill those Commandments during their mission. Suggestion for a title for your book, when it comes out: “With Strings Attached”.